The 500 Home Run Club® is still one of the most exclusive groups in professional sports. Before 1984, only 14 major league sluggers hit more than 500 career long balls, and nobody breached the legendary plateau from 1988 through 1995. So when “Steady Eddie” Murray crashed through the 500HR barrier in 1996 it signaled a second coming of aggressive new hitting stars. Since then ten more power-hitting phenoms have conquered the 500 home run mark (“Big Mac” Mark McGwire, Barry Bonds, “Slammin” Sammy Sosa, Rafael Palmeiro, “The Kid” Ken Griffey, Jr., “A-Rod” Alex Rodriguez, “Big Frank” Thomas, "The Thomenator" Jim Thome, “Man-Ram” Manny Ramirez and Gary Sheffield)…and gone on to pass their childhood heroes on the all-time list. 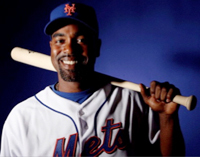 The next power hitter to join the 500 Home Run Club® could very well be 37-year-old Puerto Rican slugger Carlos Delgado, who with 473 career blasts is just 27 round-trippers shy of joining his idols. Although 2010 will be Delgado’s 18th season in “the bigs” he is still capable of sending balls flying out of any MLB ballpark and several teams (including his most team The New York Mets) are reportedly interested in signing his powerful bat. According to Mets Skipper Jerry Manuel, “I still believe he (Delgado) is going to be a dominant hitter (next year)." 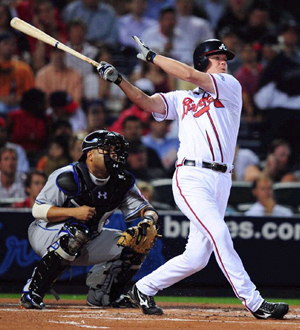 Cruising into his 17th season with the Braves, Chipper Jones currently has 426 homers and is at least three seasons away from 500. But don’t count him out! He has two years left on a 3-year contract plus an option year. The remarkably consistent Mr. Jones has played his entire career in Atlanta and is one of the best switch-hitters ever to play the game. He has averaged 24+ homers per year and is the only lefty-righty threat to boast a batting average over .300 (he's at .307) while slugging 400+ home runs. The 37-year-old, winner of the National League MVP Award in 1999 and a six-time All-Star. Jason Giambi has 409 after 14 years in the league, and Vlad Guerrero has 407 after 13 seasons. So, while both have a long way to go to reach the magical 500 mark, they have the skill set to get the job done. 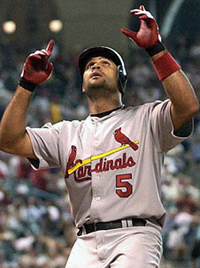 St. Louis slugger Albert Pujols is among the new icons for sluggers in the MLB. The 2009 League MVP has gone yard 366 times in just nine seasons and finished with a Major League Baseball best 47 home runs in 2009, while batting .327 and knocking in 135 RBIs. He has hit 37 or more homers during seven of his nine season and, despite undergoing arthoscopic surgery to remove bone spurs in elbow this off season, has shown no signs of slowing down. So, when you do the math, all he needs is four more “Phat Albert-like” seasons and he’s in the club. Another power hitter extraordinaire who many predict will one day join the MLB’s elite as a member of The 500 Home Run Club® is Ryan James Howard first baseman for the Philadelphia Phillies. 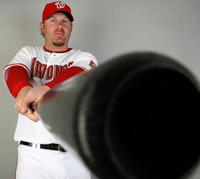 One of the game's most feared sluggers, Howard won MLB “Rookie of the Year” honors in 2005 and National League MVP during his sophomore season by cranking out 58 “very” long balls in 2006. But it wasn’t until he out-classed the competition by crushing a total of 23 home became runs out of PNC Park over three rounds to win the CENTURY 21 Home Run Derby at the 2006 All-Star Game that the world took notice of this Philly phenom. 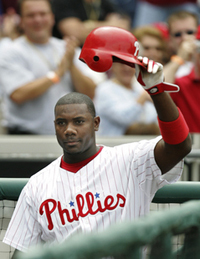 Howard continued his torrid hitting the following year and on June 27, 2007 the fastest player to reach 100 home runs in league history (100 homers in 325 games). He hit another 50 out during his next 170 games to shatter the record for fewest games to hit 150 home runs (495). Clearly the sky is the limit for Howard. He has 222 homers in just the first six years of his career, and is already being touted as the man who could eventually surpass Barry Bonds as the all-time Home Run leader. He certainly has the talent, but only time will tell if he has the longevity and consistency to be the best of the best. Washington National Adam “Big Donkey” Dunn has 316 home runs after nine years in the league. Over the last four years, Dunn has finished the year with 40 home runs exactly and also contributed to 46 blasts before that stretch making it five straight years with 40 or more home runs. Not too shabby!